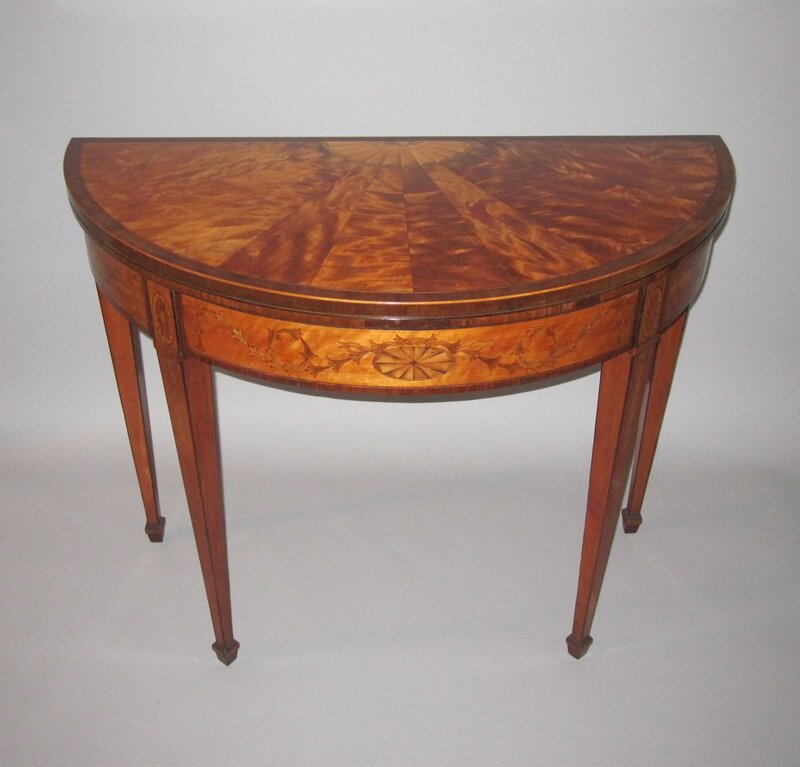 A FINE GEORGE III SATINWOOD & MARQUETRY CARD TABLE. CIRCA 1790. A VERY FINE GEORGE III SATINWOOD & MARQUETRY CARD TABLE. CIRCA 1790. Irish in the manner of William Moore, Dublin.The demi-lune radial segmented top cross banded in harewood with ebony and box line stringing and with a central inlaid satinwood fan with floral paterae; and over a panelled frieze in the neoclassical style with swagged harebells and oval fan paterae; raised on square & tapering legs with inlaid draped harebells and terminating in spade feet. William MOORE a Dublin cabinet maker was listed in directories, first working at Abbey Street (1785-91, and then at Capel Street (1792-1814). He used fashionable satinwood embellished with marquetry inlays to create furniture that was similar to the work of the English architect & furniture designer Robert ADAM. Before setting up his business in Dublin, William Moore trained in London with the prominent cabinet-making firm of Mayhew & Ince, and his marquetry is very similar to that on pieces from their workshop (such as the Duchess of Manchester's cabinet in the V&A's collection). His work was highly regarded and the marquetry and detailing on this card table are typical of his work.